With the Fourth of July holiday about to peek around the corner, I can just taste the delicious, juicy hamburgers laced with wafts of fireworks’ smoke and soot. Okay, perhaps I’ve been attending the wrong backyard BBQs, but maybe you’ve been to one (or at least heard one from your yard)—the fireworks before the fireworks party? The “itching to set off sparkly explosives because I can’t wait for the main event” kind of get together? For some, fireworks never get old. For us, it’s our JT01 fanless case, which was designed for the Intel D945GSEJT (Johnstown) Mini-ITX mainboard and launched roughly a year ago. We’re on our latest revision and will soon see a new release with the coming of Intel’s Marshalltown platform (low-profile board poised to replace the Johnstown in late Q3). So, we’re kind of having our own fireworks before the fireworks party. Except at this one, you don’t have to worry about dodging a badly launched Roman candle as you dig into your jello mold. Okay, I’ll set the hackneyed analogies aside, and get down to brass tacks: we have a fully configured, pre-built system with Ubuntu Linux installed, all for $299. 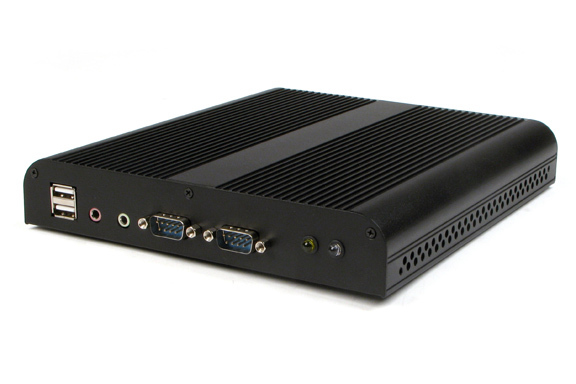 It’s designed around our SLFJT-01 Fanless Mini-ITX Case with the Intel D945GSEJT mainboard. And it is here for another “hurrah” before the next big thing. The entire system itself is low-profile (under 1.5 inches thick) and runs pretty cool, so stick it under your desk, in a cabinet or closet, and forget about it. It makes an excellent, low-powered alternative desktop, wireless router, or for more industrial types, use it for data acquisition, system/equipment/machinery monitoring, and more. Or maybe make your own wireless fireworks controller? This one will at least be protected from ash and smoke! Just as a disclaimer, we certainly don’t recommend careless use of fireworks or setting off Roman candles into jello molds.